Pier fishermen often catch what many consider to be “trash” fish. Stingrays, eels, dogfish, and puffer fish are common in shallow coastal waters during the summer and readily take bait. Although fishermen usually throw them back in the ocean, they are all good to eat. Pieces of stingray wings cut with a cookie cutter are used to make mock scallops. Eel is a delicacy I have enjoyed. Dogfish, a small species of shark, really does taste like chicken when fried. During WWII when rationing made meat scarce, fishermen caught hundreds of thousands of pounds of puffer fish off Long Island and sold them in New York City fish markets under the name “sea squab.” However, an important cautionary note needs to be made about consuming puffer fish–its flesh is toxic in some regions. From researching this topic online, I’ve determined puffer fish caught from North Carolina to Massachusetts are safe to eat, but puffer fish caught from Florida south to the tropics are deadly. It is against the law to consume puffer fish caught off Florida’s coast because it contains so much saxitoxin. I have not been able to determine whether puffer fish caught in the border region in between Florida and North Carolina are safe, so I wouldn’t chance it. Video of a man cleaning puffer fish caught off the North Carolina coast. It yields a piece of fish about the size and shape of a chicken drumstick. Illustration of puffer fish before and after it blows up. The northern Atlantic puffer fish, also known as a blowfish, is a member of the Tetraodontinidae family which includes 29 genera and 191 species. 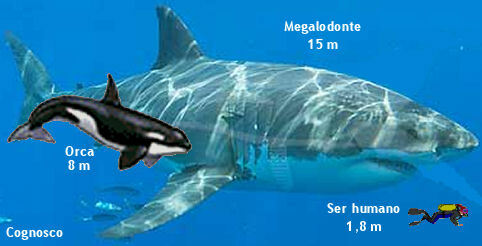 Most of these species occur in tropical waters and are toxic. The family includes the famous fugu fish served in Japan where specially trained chefs dress them in a way that makes them safe for human consumption. Toxins are heavily concentrated in the liver and gonads. Puffer fish inhale air or water when threatened, and they have prickly spines on their scales. This makes them tough for predators to grasp or swallow. Ospreys are unable to grab puffer fish. This defense mechanism has helped this family survive for millions of years. Definitive fossil evidence of species in the Tetraodontinidae family has been unearthed from strata dating to the Cretaceous over 100 million years ago, and some specimens that may belong to this family were found in Triassic deposits. The northern puffer fish evolved to live in cooler waters than its tropical cousins. Cooler ocean currents began to expand in circulation early during the Pliocene when Ice Ages began to occur. This may be when the northern puffer fish diverged from the southern puffer fish (S. nephulus) which reaches its northern range limit off the coast of north Florida where the 2 species overlap. 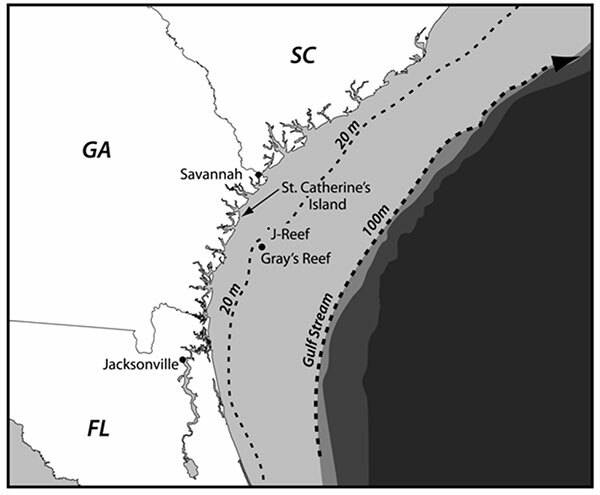 In this area northern puffer fish inhabit deeper waters to avoid competion with S. nephulus. Northern puffer fish move into shallow waters over most of the rest of their range during summer but move to deeper waters when the water temperature seasonally cools. This pattern may have been disrupted following Ice Age Heinrich Events when the Gulf Stream shut down due to influxes of glacial meltwater. There is no known Pleistocene-aged fossil evidence of puffer fish, and scientists have not yet studied the Tetraodontinidae family genome. Puffer fish prey on crustaceans (schools of puffer fish gang up on blue crabs), molluscs, worms, and sponges; and they consume seaweed and algae. The species of algae they eat in warmer waters is toxic, and this is how they acquire their toxicity. This explains why the same species is safe to eat when caught from cold waters but toxic from warmer regions. There is no antidote for this kind of nerve poison. It shuts down the victim’s nervous system. A victim may recover in a few hours or days or they may die from suffocation while wide awake as their lungs and heart cease to operate. 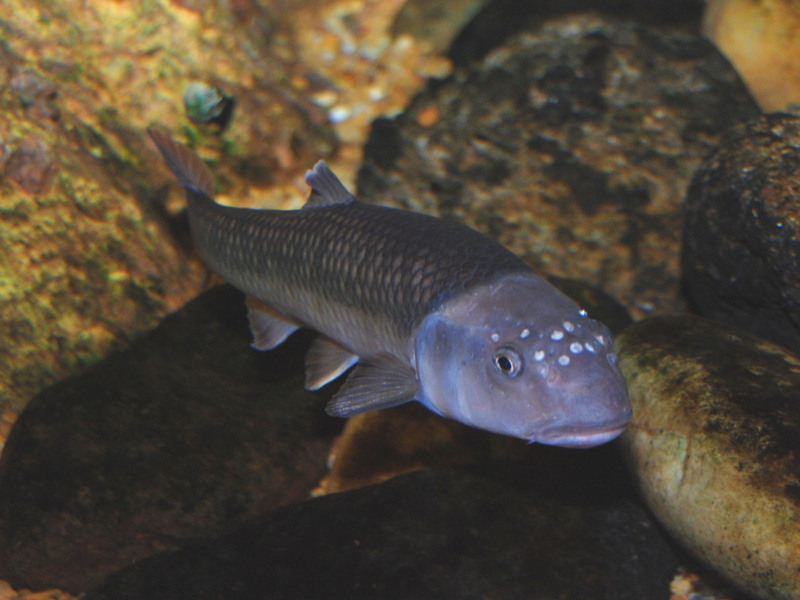 The bluehead chub (Nocomis leptocephalus) is a keystone species in piedmont and mountain rivers and streams of southeastern North America. 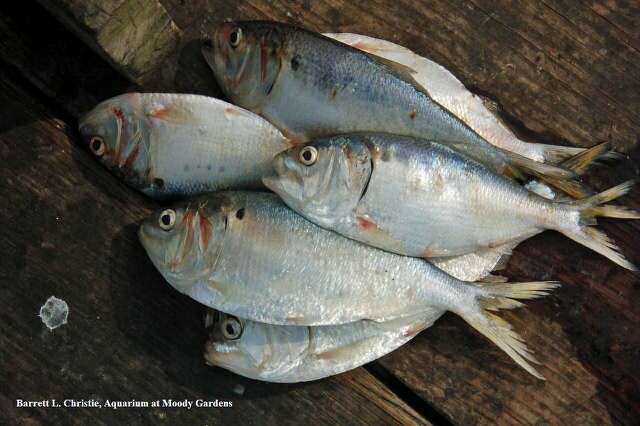 Dozens of species of shiners spawn and lay their eggs in bluehead chub nests. Without the existence of bluehead chubs most of these species would probably become extinct. Bluehead chubs and shiners are members of the minnow family, known scientifically as the Cyprinidae, and bluehead chubs are 1 of the largest minnow species, growing up to 8 inches long. Bluehead chubs make large gravel nests and aggressively protect their young. They bury their eggs with large pieces of gravel and in the process bury and protect the eggs of other minnow species. A complex ecosystem inhabits bluehead chub nests. Many macroinvertebrates live in bluehead chub nests alongside the minnow eggs. Snails, clams, and the larval stages of dragonflies, dobsonflies, caddisflies, and beetles use the bluehead chub nests for shelter. Salamanders and darters prey on the invertebrates entering and exiting the nests. Scientists believe shiners and bluehead chubs both benefit from the congregation of eggs and hatchling fish, referring to the relationship as mutualism. The great abundance of eggs from several different species dilutes the losses to predators, and more young of each individual species survives. 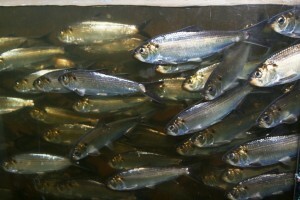 Rainbow shiner (Notropis chrosomus). Some shiners can get quite colorful. Many other species of fish associate in the same nests. Rough shiners (Notropis baileyi), saffron shiners (N. rubicroceus), and greenhead shiners (N. chlorocephalus) spawn in creek chub nests. Redfin shiners (Lythurus umbratalus) spawn in green sunfish (Lepomis cyonellus) nests. All of these associations result in increased reproductive success for both species. Some shiners will use central stoneroller nests, but prefer chub nests and will move their spawning activity to bluehead chub nests, if they become available. The evolution of fish nest association must be very ancient. It seems likely the host fish evolved first, and the species of fish using the host’s nest lost their ability to make their own nests when they came into contact with the larger host species because the host could build bigger nests that offered more protection. Host species are usually larger and better able to defend the nest than the smaller minnows, but they benefit too from the sudden population explosion of potential food for predators that might otherwise eat their hatchlings. 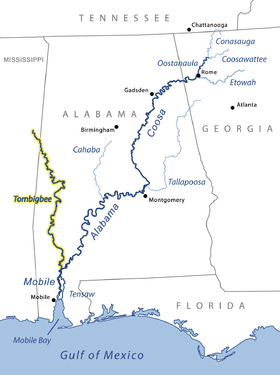 The many present day creeks and small rivers that flow through the piedmont region of central Georgia originated between 15,000 years BP-8,000 years BP when water tables rose as a result of melting glaciers far to the north of the state. Before this, during the Glacial Maximum, the regional landscape was much more arid and only the largest of rivers and creeks still flowed…and those were often low flowing and clogged with sandbars. Intermittent springs probably occurred in the lowest areas of topography along the present day courses of smaller streams. Climatic phases with increased precipitation raised the water table enough to cause water flow between springs, and these creeks eventually emptied into the nearest river. So much atmospheric moisture was released at the end of the last Ice Age that rivers and creeks had a larger flow than they do today. This occurred between ~10,000 years BP-~5,000 years BP when rivers were classified as “supermeandering.” Fish found their way from rivers into newly formed creeks during the late Pleistocene/early Holocene, though a few species may had persisted in relic Ice Age springs before water tables rose. About 40 years ago the noted naturalist, Charles Wharton, electro-fished a small unnamed creek located 1.4 miles south of Sopa Creek, a tributary of the Chattahoochee River, and he determined the “near original” composition of fish species typical of piedmont streams that flow into this river. These creeks flow through steep terrain often between high bluffs and where protected are still very beautiful natural areas. Cobb County, Georgia. Charles Wharton electro-fished a small stream here over 40 years ago and determined the original fish species composition of piedmont Chattahoochee feeder creeks. This is where Sopa Creek flows into the Chattahoochee River. Sherman ordered his troops to cross over the rocks here during the Civil War. The fish species Wharton found in his survey included band fin shiner ( Notropis zonistius ), central stoneroller ( Campostoma anomalum ), creek chubsucker ( Erimyzon oblongus ), Alabama hog sucker ( Hypentelium etowanum ), yellow bullhead catfish ( Ictalurus natalis ), bluegill ( Lepomis machrochorus ), and banded sculpin ( Collus carolinae ). The band fin shiner is a small minnow native to the Chattahoochee River drainage, though it has been introduced to other river systems wherever fishermen dump their bait buckets. The stoneroller is a widespread species in the Midwest. It eats algae and may school in the hundreds. They grow up to 8 inches long. The creek chubsucker can grow twice as long as the stoneroller, and it eats small crustaceans and insect larva in addition to algae. 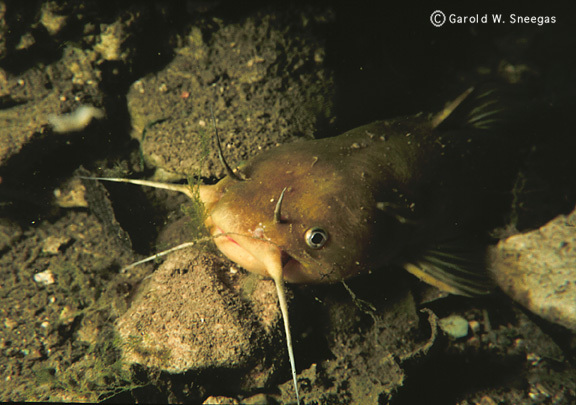 The yellow bullhead catfish is omnivorous and can grow up to 6 pounds, though it normally reaches a weight of about 2 pounds. 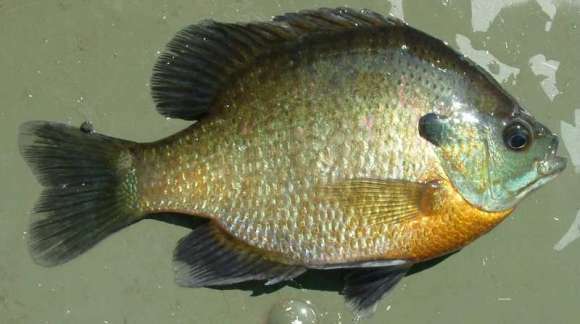 Bluegills also grow large enough to make a good meal. Early settlers placed fish traps in the nearest streams and caught supper, while they were busy clearing and cultivating their land. Bluegills and catfish living in clear moving streams with rocky bottoms probably taste better than those taken from muddy ponds. The banded sculpin is a freshwater relative of a large family of saltwater species. Banded sculpins are nocturnal ambush predators that live under stones. They compete with crayfish for the same type of habitat. The origin of the name Sopa Creek has a disputed origin. This stream flows for 11.6 miles through Marietta until it empties into the Chattahoochee River. Today, the headwaters emerge from a spring under a manmade culvert, but I’m sure the original landscape was picturesque. Now, it is surrounded by suburban sprawl. Some say this creek gets its name from the foam caused by water rushing through rocks. The foam resembles soap spuds, and supposedly an early mapmaker misspelled soap. 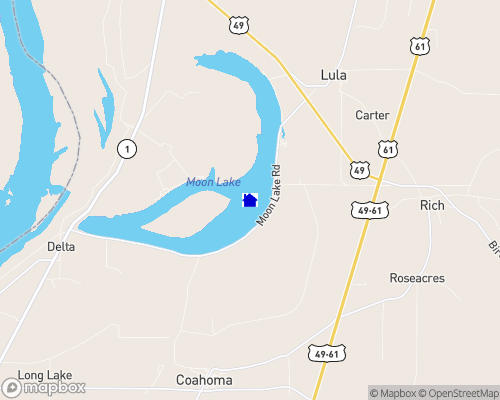 Others claim the creek is named after an old Cherokee Indian (Old Sopa) who lived nearby. He reportedly refused to be removed when is compatriots were force marched to Oklahoma on the Trail of Tears. You are currently browsing the archives for the Ichthyology category.